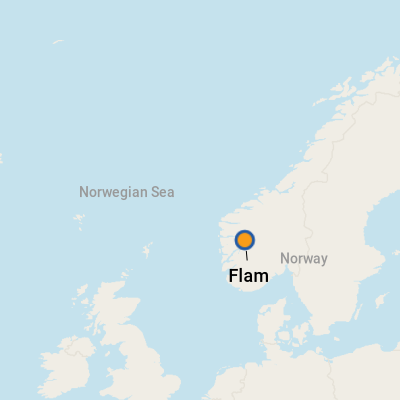 Flam, meaning "little place with steep mountains," could not have a more perfect name. The storybook hamlet, population 350, is nestled on Aurlandsfjord, the innermost arm of the world's second longest fjord, Sognefjord, which stretches halfway to Sweden. With its snow-capped mountains, waterfalls, river, meadows and picturesque farms, Flam is beautiful throughout the year, but most popular in the summer when travelers flock here for the dramatic fjords and outdoor activities. Flam is also a good starting point for a day trip to Naeroyfjord, an arm of Sognefjord, and newly designated UNESCO World Heritage Site. Flam's popularity as a tourist destination began in the late 19th century with the arrival of steam ships carrying English and German passengers. Germany's Kaiser Wilhelm and Europe's royals were also frequent summer visitors -- attracted by salmon fishing in the Flam River. In 1909, the opening of the Bergen Railway established Flam as a junction for passengers and goods between Oslo and Bergen. Back then, horse drawn buggies carried vacationers through the spectacular region. Today, Flam is Norway's fourth largest cruise port (by number of calls -- fifth largest by number of passengers). 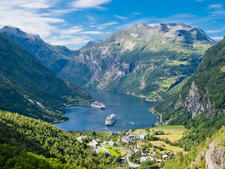 Around 175 cruise ships squeeze through the narrow fjord annually, bringing thousands of visitors to the tiny town. As terminus for the celebrated Flamsbana, considered one of the world's most scenic rail trips, Flam also receives several hundred thousand train visitors a year. Thousands of Norwegians come in summer and fall to experience Rallarvegen, a spectacular cycling route. The Flam cruise pier is right in town and a short walk to everything. Three ships can be in port on the same day. There is no port building with facilities, but everything in town is within a five-minute walk. Public toilets and tourist information are in the Flam Railway Ticket Office building, and restaurants, shops and tour providers all line the harbor. The weather in fjord country can change quickly, so it's best to be prepared and dress in layers and bring an umbrella. If you're booking tours in advance, consider whether you're willing to do them in the pouring rain before you commit. On foot: Everything you need in Flam is within walking distance. There are also several walking/hiking paths that leave from the town. A map is available at the tourist office. By car: Flam's sole car rental office, Flam Bilutleie A.S., is located at Heimly Pension, about 425 yards east of the rail station (e-mail post@heimly.no or call +47 57 63 23 00). You'll want to book your rental in advance if you're planning on driving to Undredal (20 minutes), Stalheim (30 minutes), Osterbo (45 minutes) and Voss (one hour). By public transit: A far less costly way to enjoy the area is by public transportation. The bus stop is located about 200 yards from the dock, just before the train station. Take the bus to Aurland to visit the shoe factory, glass blower and scenic viewpoint. 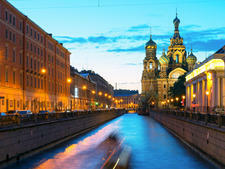 Organized bus tours are also available from independent tour companies. By boat: Daily ferries leave year-round from Flam to Aurland, Undredal and Naeroyfjord. Choose from two companies, Sognefjord AS and Fjord1, and definitely book in advance. Fjord1 is the public ferry that sails between Flam and Gudvangen on the Naeroyfjord. Sognefjord AS is a tour company that offers a boat trip to Gudvangen and a scenic bus ride back. By bike: Bikes are available to rent at Haugastol Turistsenter near the train museum. Choose a two-hour or full-day rental and bike along the fjord or into the valley. The official currency is the Norwegian krone (NOK). For current currency conversion figures, visit www.oanda.com or www.xe.com. Unlike Denmark and Sweden, Norway is not a member of the European Union, and the euro is not legal tender. Aurland Sparebank has an ATM one minute's walk from the ship. Norway features two official languages; bokmal or "book language," derived from Danish, and nynorsk (new Norwegian), derived from many rural Norwegian dialects. Bokmal is the more common, with nynorsk spoken in the fjord country along the west coast and in the central valleys. Norway's oldest language, Sami, is spoken by the country's indigenous people. Most Norwegians also speak very good English. Interestingly, fjord is a Norwegian word that's become part of the international lexicon. Scenic Flam is a good place to try Norwegian specialties like lamb in cabbage, smoked salmon, cloudberries and whipped cream, and goat cheese. It's also a fine setting for an ice cold glass of aquavit (a 40-proof potato-based liquor invented in Norway) or a beer. Local Eats: Cafe Flam Marina is good for light snacks with scenic fjord views and outdoor seating. Flamsbrygga offers several dining options. Furukroa Cafe serves up game meatballs, venison burgers, sandwiches, ice cream and waffles in a cafeteria setting. (Hours vary; open 8 a.m. 8 p.m. June 1 to Sept. 2, 2018) Flamstova Restaurant is a sit-down restaurant with a lunch buffet from noon to 3 p.m. And the Aegir Brewery & Pub is open daily from noon for local beer tasting and serves pub fare (burgers, ribs, fish soup) after 4 p.m. The building is done in Viking style with a central hearth and wood furniture draped in furs. You can certainly pick up Norwegian's signature knitwear (Dale and Oleana are good, but pricy brands), cheese slicers, troll figurines and Norway T-shirts and gifts at any of Flam's souvenir shops. But for something truly local, go to Aurlandskoen, by the Fretheim Hotel, and pick up a pair of shoes made in nearby Aurland. They look like penny loafers and come in an array of neutral and bright colors. Alternatively, the shop at the Railway Museum sells Flam Railway logo items. Whether you're touring tsarist-era palaces in St. Petersburg, Estonia's cobblestone alleyways or the islands of Stockholm, the Baltic's attractions and astounding beauty will wow you whatever you do. To give you a unique and immersive experience in each of these countries, we've highlighted a few of our favorite Baltic cruise excursions. Please note: Although these are popular tours, check with your cruise line before you book to ensure your preferred excursion is offered. With summer sunshine until midnight, tranquil ports and the beauty of the fjords, a Norwegian Fjords cruise may suit you, like it did our first-timer. 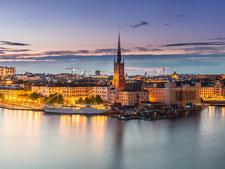 The Baltic -- with its marquee ports of St. Petersburg, Stockholm and Copenhagen -- is a popular bucket-list cruise destination, but that means your first once-in-a-lifetime cruise there is possibly also your last. You definitely want to get everything right on the first go if there's not going to be a repeat visit to learn from your mistakes. To help you out with some Baltic Sea cruise tips, here's a recap of what we learned on our first cruise to the Baltic and Northern Europe.